Our day started early in the morning. 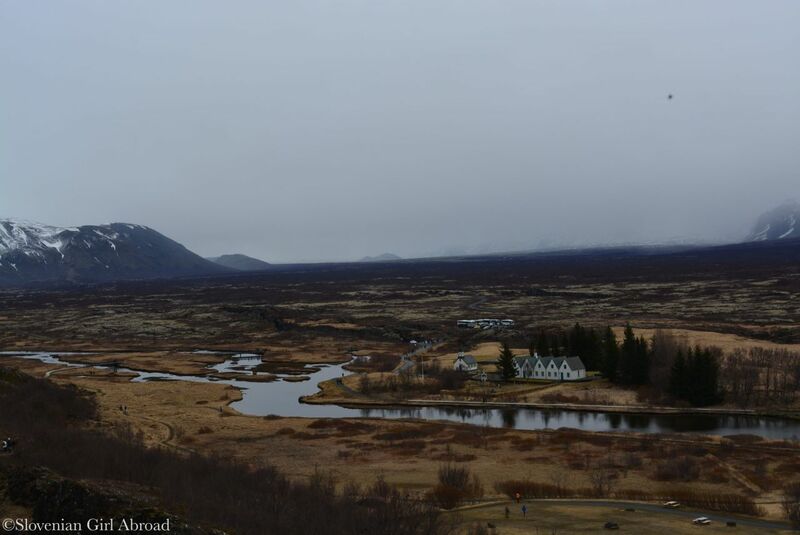 We left our guesthouse in Reykjavik and drove to the first destination of our Golden Circle tour: the Þingvellir (Thingvellir) National Park, a site of historical, cultural and geological importance located in an active volcanic area, only 49 kilometres east of Reykjavik. The Þingvellir National park lies on the banks of Lake Pingvallavatn, in a rift valley full of dramatic fissures and cliffs that marks the crest of the Mid-Atlantic Ridge and the boundary between the North-American and Eurasian tectonic plate. Continental plates are drifting away from each other at a rate of 1 to 18 mm per year and are making spectacular landscape. 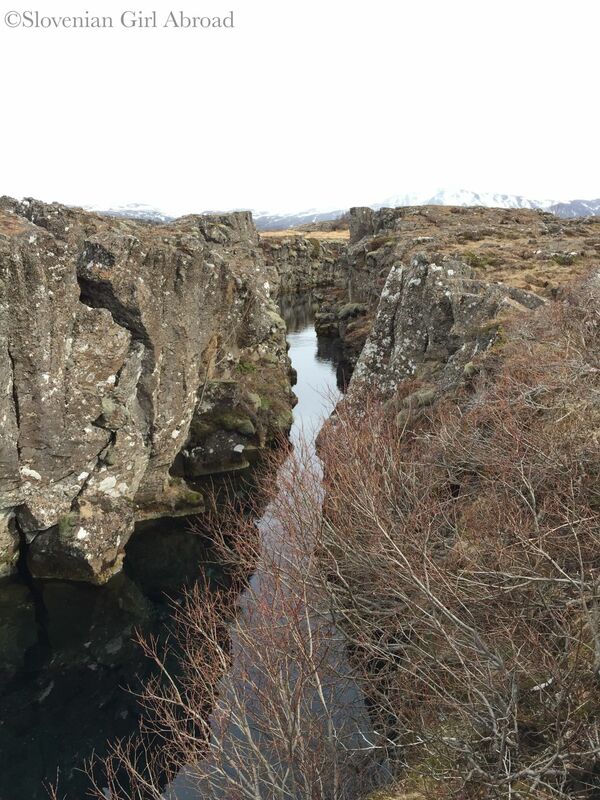 Enclosed by a mountains and grass-covered lava fields Þingvellir is a place of vivid beauty. In spectacular scenery of Þingvellir, the Althing – the open-air assembly representing the whole of Iceland was established in 930. For over eight centuries, the assembly met here annually to set laws and settled disputes. The Althing has deep historical and symbolic associations for the people of Iceland. To protect the area where it was held, national park was founded in 1930. In 1950s and 1998 was extended to an area that now covers 93 square kilometres. In 2004 it was also inscribed to UNESCO World Heritage list. 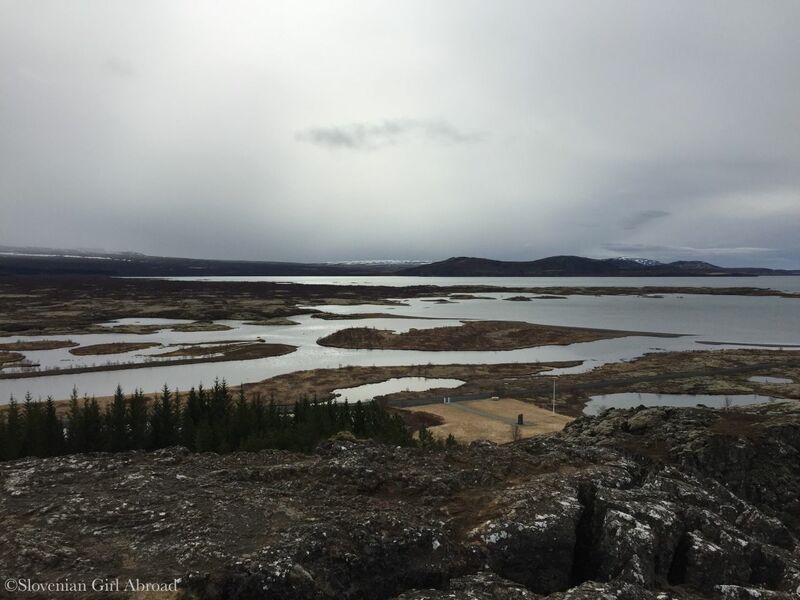 We walked around rather busy Þingvellir area, admiring the dramatic landscape and imagining how the first assemblies looked like when Icelandic Vikings first met here back in 10th century. Nowadays, only few stone foundations of the ancient encampments can be seen. Most of the preserved buildings dates from the later era (for instance Þingvallakirkja church and little farmhouse). Our next destination was Brúarfoss waterfall. This place is not part of the mainstream Golden Circle tour, but it is in my opinion the most memorable, unspoiled and beautiful place we’ve visited on our Iceland trip. Brúarfoss waterfall is a bit tricky to find – there are no signs pointing towards it – but it is well worth the effort to get there. We followed the detailed instructions I found on the Unlocking Kiki blog. After driving the road no. 355 that connects Þingvellir and Geysir, we turn to correct road and reached the summerhouse area. We parked our car there and somehow managed to follow the correct footpath to the waterfall. We weren’t disappointed. Impressive vibrant blue colour on the backdrop of black rocks was stunningly beautiful. Despite it wasn’t the largest, nor most majestic waterfall I’ve ever seen, was definitely one of the most memorable ones. After founding this Iceland’s hidden gem, we returned back to our car and continued our Golden Circle tour. 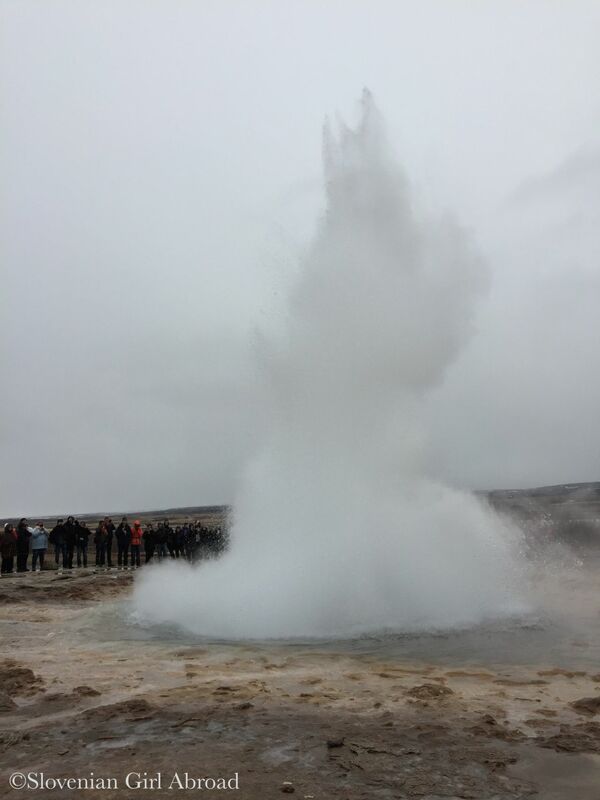 Next stop was the Haukaladur geothermal region where the geysers can be found. 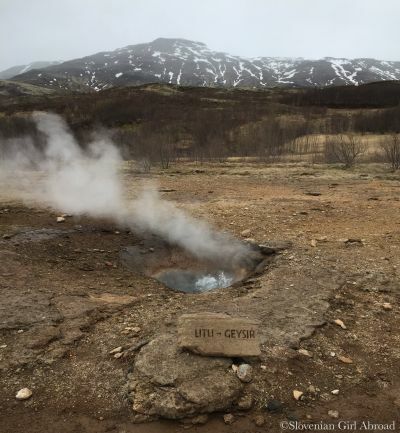 The most famous of all geysers in the area is probably the Great Geysir – the original hot-water sprout after which all other geysers are named. It has been active for some 800 years and was once able to gush water up to 80 meters. But it has been dormant since 1916 when it has stopped gushing water. It came to life only once in 1935, and as quickly went back to sleep. Luckily, there are more geysers in the area that still gushes water. Strokkur is the fourth largest geyser in the world which erupts every 5-10 minutes in 15-30 meters plume. We saw it erupting several times and it was spectacular. 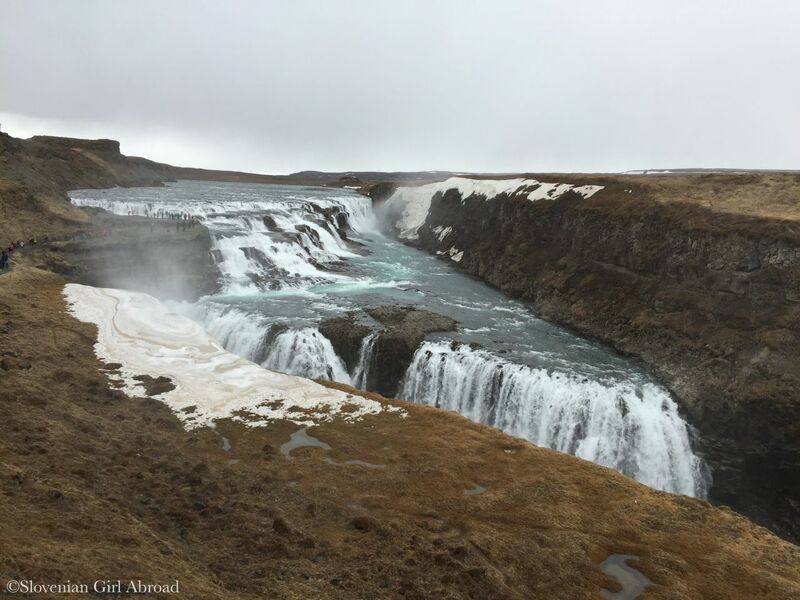 After we strolled around the hot springs area, we drove to nearby Gulfoss waterfall – Iceland’s most famous waterfall. By the time we got there it started to drizzle. But that didn’t stop us from exploring. The Gulfoss waterfall is quite a sight when you first catch a glimpse of it. The water from river Hvítá falls down 32 meters in two majestic cascades before thundering away down a narrow ravine. Apparently on sunny days, the mist over Gulfoss creates rainbows. That must create very different sight in comparison to the sight we’ve witnessed. On a cold grey rainy day was Gulfoss beautiful, but rather underwhelming. Drizzle and cold wind soon chased us away. Searching for a warmth, we stopped at the tourist centre where we did some souvenir shopping, then we hit the road again. 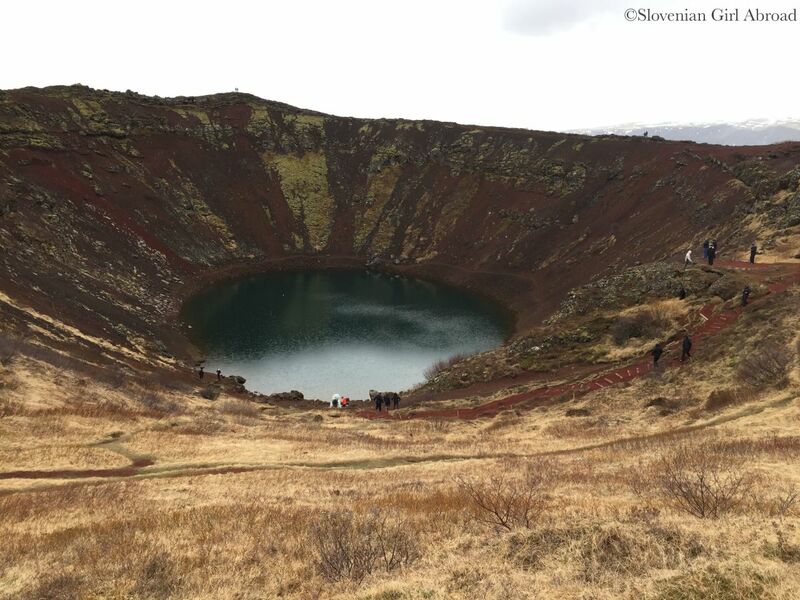 Our next stop was Kerið Crater, an explosion crater formed about 6500 years ago after the volcano erupted, and collapsed in on itself. 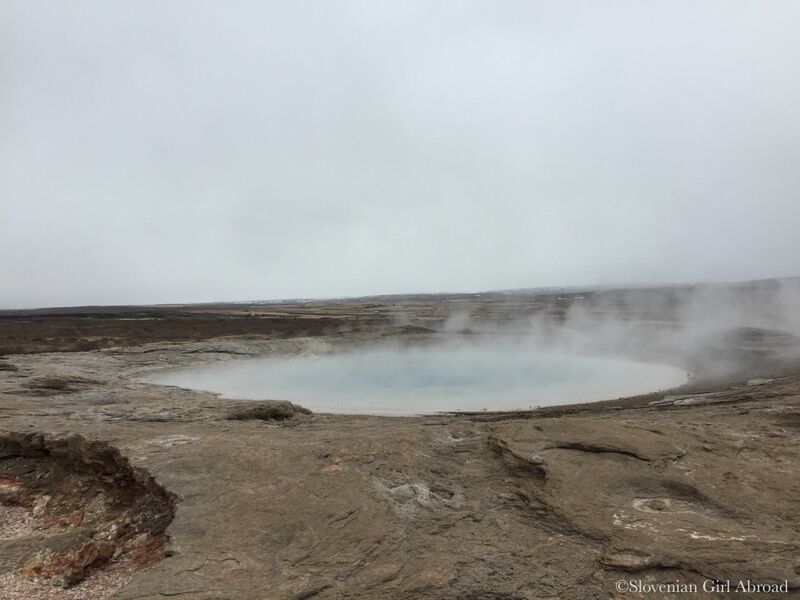 Because it is located just next to the road no 35 from Geyser to Selfoss was a must additional stop on our Golden Circle tour. When we arrived to the crater, we were surprised to found out there is a booth collecting entrance fee. 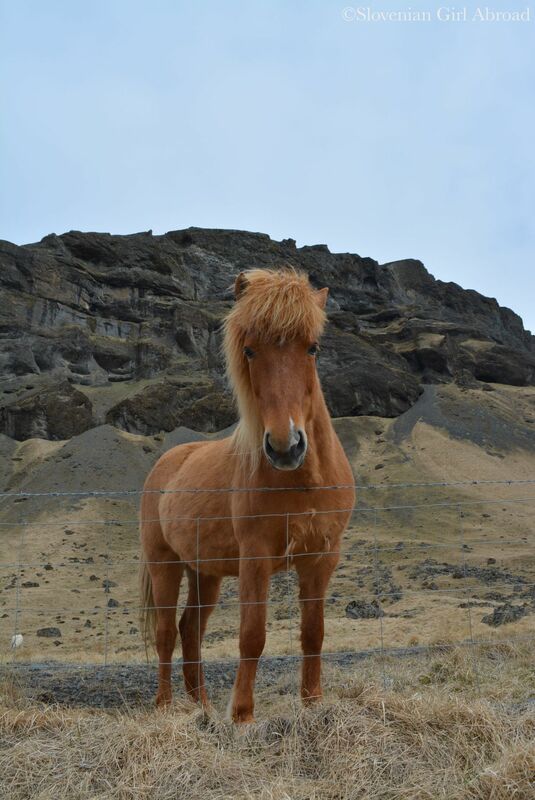 No other attraction in Iceland charged entrance fee. But soon we found out that there is no one in the booth and the cashier’s desk is closed. 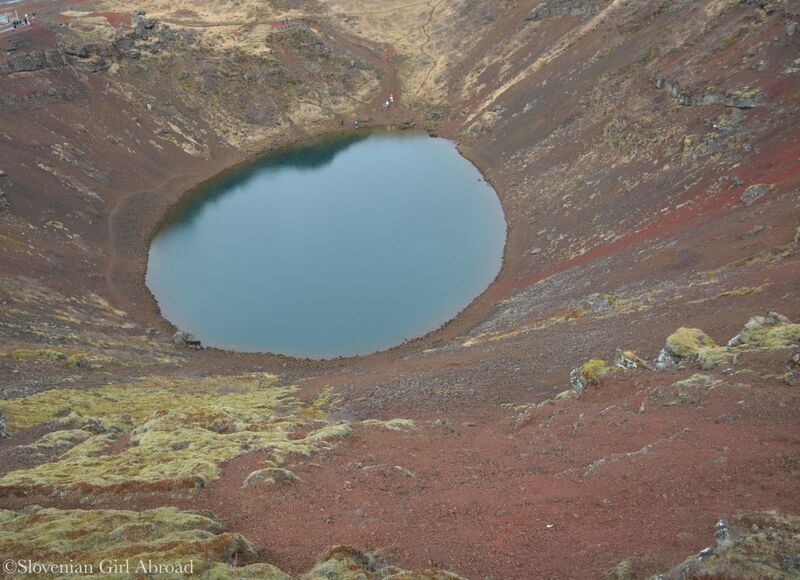 The doors to the crater were wide open and we didn’t want to skip the chance to visit the Kerið. Therefore, we followed some other visitors through doors and went exploring the crater. 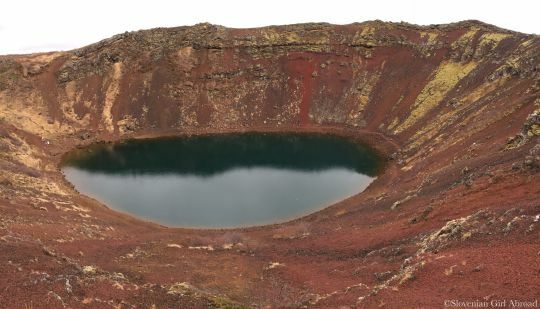 The crater is about 270 m long, 170 m wide and 55 m deep. We walked around the edge and down to the lake inside the crater. It was such a nice and scenic place. Like many times before that day, I thought nature really got creative in Iceland. 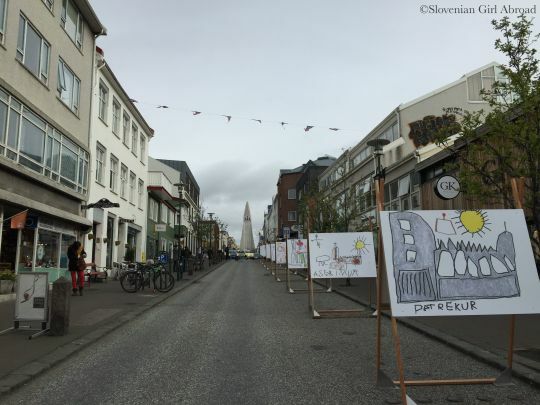 When we finished exploring the crated, we returned back to Reykjavík. We went out for a dinner and after for a strolled around the town. 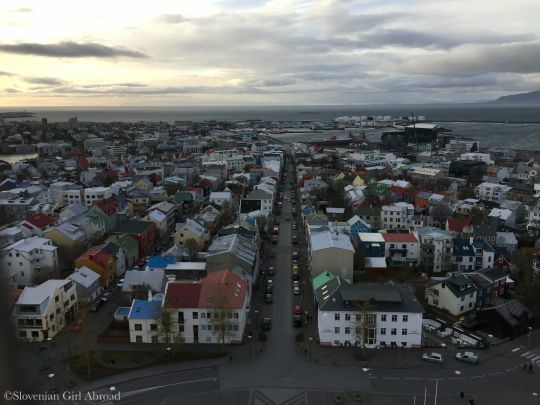 We also climbed the Hallgrímskirkja church tower and admire the lovely panoramic views. Then we returned back to our guesthouse where we’ve spent the last night in Iceland. Gorgeous photos: I love the clear blue water and the waterfalls. Love the blue glacial water. The Brúarfoss waterfall is breathtaking!!! WOW! It’s always good to explore the not so mainstream attractions although I’m surprised that this one isn’t. Yeees, Brúarfoss is amazing. I think it is just the matter of time before before it is discovered by the mass tourism. I hope I’m wrong, though. I think the quest of finding it makes the visit even more memorable. Wow, I have never seen anything like that. Gorgeous photos. They almost look like they belong in a fantasy novel. Defies gravity. And that horse is beautiful! I am so jealous. The Brúarfoss falls look really awesome and a nice escape from the main circuit. What were the tourist crowds like during your visit? Indeed it was. 🙂 Have you been there? It wasn’t too bad. Main attractions were busy, but not too busy. There are just not enough adjectives to describe this place. Breathtaking, stunning and captivating scenery. Would love to be able to go there one day. Beautiful! Iceland landscape i think is one of the most amazing in the world! Visiting Iceland must feel like being in another planet. Great pictures! Bruarfoss and Gulfoss are definitely in my list for Iceland! Can’t wait to get back and explore the country properly! Yet another place for the bucket list…. Indeed it was! But I love such days. 🙂 Yes, not many people go to Brúarfoss. It is not mentioned in any guide book I’ve read, nor it is advertised and if you don’t have good instructions is probably impossible to find. What a wonderful day! 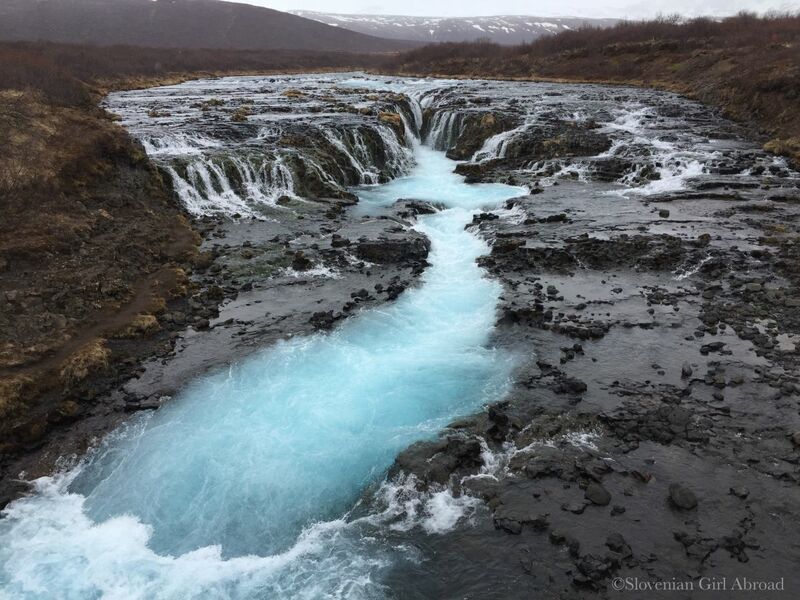 And we didn’t know about Bruarfoss waterfall – it looks lovely. Maybe we’ll see it on a third trip to this beautiful country! Once is never enough.